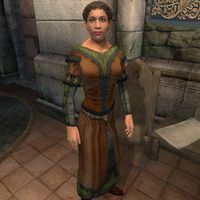 Alessia Ottus is an Imperial commoner who can be found wandering in the Imperial City's Market District and Temple District. She can also be found in Skingrad. She is married to Hastrel, and they have one daughter, Ida. Alessia is the author of the guidebooks to each city, which are full of bigoted criticisms and observations. Her few favorable descriptions, particularly of the Temple District of the Imperial City, are insipid and almost devoid of any true analysis. She seems to be heavily prejudiced against Nords, Orcs, Dark Elves, Khajiit, Argonians, merchants, sailors, arena contestants, beggars, and the ancient Ayleids. She also has a deep hatred and distrust of the Mages Guild and the use of magicka, considering mages to be "godless". The upper classes of Cyrodiil will delicately state that "I have not read the works of Mrs. Ottus. I'm told some find her guide books useful, though she apparently has strong opinions on some matters." She sleeps in a single bed upstairs in the Ottus' house from midnight to 6am, then spends the next few hours bustling about downstairs. On Loredas she heads to the Arboretum at 10am and stays there until 5pm, chatting to other locals. On Sundas she stays in until midday then walks around the Temple District for four hours before going to a service in the Temple of the One until 8pm. On all other days she leaves the house at 1pm and walks around the market district until 5pm, after which she goes to the Temple District for an hour. Whatever she does during the day, she eventually returns to the house and walks around the ground floor before bedtime. There are two exceptions. On the 10th of each month, at midday, Alessia heads to the Black Horse Courier offices, where she was supposed to play a role in the Imperial Couriers Unfinished Quest - she wanted to send a message to Hafid Hollowleg in Bruma. On the 2nd of the month, she heads to the Two Sisters Lodge in Skingrad. At 8am the next morning, she will head to the area near the guild halls and shops and walk around for eight hours. After that, she will head back to the Imperial City and resume her usual schedule. During the Light the Dragonfires quest, Alessia (like most Imperial City citizens) is confined to her home. She wears a russet felt outfit with doeskin shoes, carrying with her a middle-class amount of gold, a spare pair of tan linens and her house key. Alessia is a devout worshipper of the Nine Divines and will introduce herself exactly how she opens all her guides: "My name is Alessia Ottus, and I'd like to talk about the Nine Divines." When asked about the Imperial City, she replies "St. Alessia has blessed our city and all its people. Visit the Temple of the One, and renew your faith." This page was last modified on 11 April 2017, at 18:30.